Oleamide works as a health-promoting supplement. People use oleamide to promote healthy sleep, feelings of relaxation, to improve their appetite, and for its health benefits. Oleamide is produced in the bodies of all animals to help them to enter into a state of sleep. If you are sleep deprived, your natural oleamide levels will be particularly high. In this article, we explore the ways that oleamide works – how it interacts with receptors and your brain to produce its wonderful effects and protects your brain from inflammation. Oleamide is a very safe dietary supplement. Oleamide interacts with receptors in your brain called GABA receptors. These receptors ‘bind’ to the neurotransmitter GABA, as well as many other similar compounds. When you feel the calming, relaxing effects of Oleamide, this is because of how it binds to GABA receptors. Oleamide’s interaction with GABA receptors also produces sleepiness and promotes healthy REM sleep. This is why Oleamide is so great to use in the evenings before going to sleep. You can also use Oleamide on a day when you don’t have much to do, and would like to take some time to chill out and relax. Oleamide also interacts with your brain’s serotonin receptors. Many psychoactive compounds and substances interact with serotonin receptors so these effects have been well-studied. When you feel an improved mood and an elated sensation after taking oleamide, this is because of its interaction with your brain’s serotonin receptors. Scientists have examined oleamide’s interaction with serotonin receptors in a number of studies. The potency of this wonderful compound is quite remarkable. Even at very low doses, oleamide has significant interaction with serotonin receptors, producing an increased mood. Neuroinflammation is the inflammation of your brain and nerve cells. Both stroke and multiple sclerosis result in inflammation of the brain and spinal cord. Scientists have also linked neuroinflammation to degenerative diseases like Alzheimer’s disease and dementia. 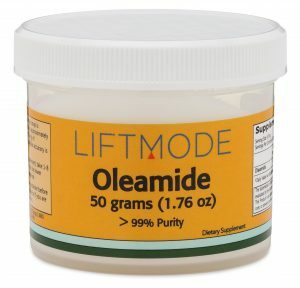 Oleamide works to reduce inflammation in your body, especially in your nerve cells and your brain. This is great for protecting your brain from stress and harm. The side effects of Oleamide have not yet been studied conclusively. Oleamide is a compound produced naturally by your body to promote sleepiness and calm your mind. It is found in high concentrations in all mammal species in situations of sleep deprivation. It is unlikely that oleamide will produce any negative side effects, and online user reviews attest to this claim. However, it is still recommended to stick to the recommended dosage of around 50 – 200 mg daily. You shouldn’t attempt to drive or operate heavy machinery while using oleamide. Don’t take oleamide if you’re using prescription medication unless your physician says it’s okay. In conclusion, your body produces oleamide naturally to help you fall asleep. The longer you don’t sleep for, the greater your oleamide levels. You can also take oleamide as a great dietary supplement to aid in sleep and producing a calm, relaxed state. Oleamide also increases many people’s appetites. At higher doses, oleamide binds to cannabinoid receptors and produces mild psychoactive effects.